Mattresses are being increasingly used in rooms other than the bedroom. Often these locations require that the mattress be fully covered in a durable fabric. If the mattress is being used in a living room, the fabric selected may be something typical for the living room. 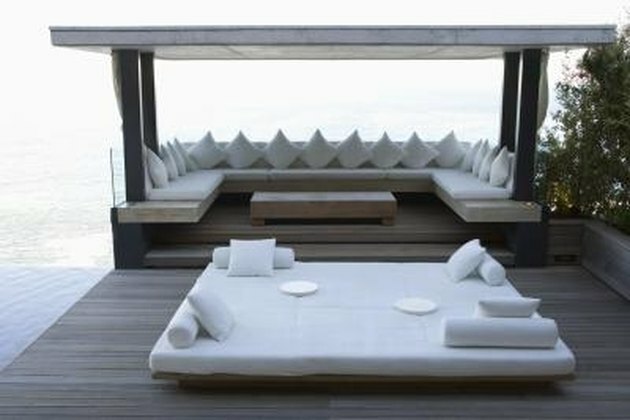 If the mattress is being used outside as a large cabana-style bed, the fabrics should be picked to be water or weather resistant. Measure the width and length of the mattress. Add 2 inches for seam allowances to each measurement for your total fabric needs. Cut your fabric to size. Measure the height of the mattress and add 2 inches. Measure the perimeter of the mattress and allow for seaming to achieve the correct length. Place your bottom fabric face side up and place the mattress on top of the fabric. Position the top fabric face side down on top of the mattress. Place your side fabric facing the mattress with the short end centered at one corner of the mattress. Pin the top edge (long side) of the side fabric to the top fabric and the bottom edge to the bottom fabric. Align your seams at the corners. Pin three sides. On the fourth side pin along the top but leave the bottom open. Remove the cover from the mattress. Sew your seams together at your pins. Ease your corners by notching the seam fabric. Iron your seams flat, turn your fabric right side out and top stitch along all the seams. Measure your open bottom seam. Cut hook and loop tape to size. Sew the hook portion of the tape to the bottom mattress fabric at the seam. Sew the loop portion to the side fabric so that the tape is very secure. It is a good idea to sew each half of the tape using two parallel seams 1/4 inch apart. This will help prevent the tape from coming loose from the fabric when you tug on the tape while opening and closing the cover. Slide your mattress inside the cover and close the cover by pressing the hook and loop tape together.